Sometimes speed is of the essence and this wooden Bullet Train will get to its destination in record time. Supplied complete with two pieces of wooden Bigjigs Rail track. Magnetic couplings ensure compatibility with all other engines and carriages in the Bigjigs Rail range. 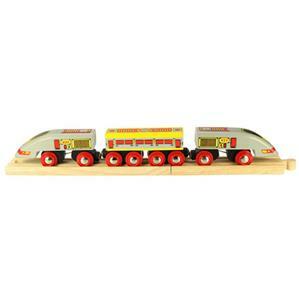 Most other major wooden railway brands are compatible with Bigjigs Rail.